At Ciambrone Vision we offer a wide selection of contact lenses including disposable soft contact, bifocal/multifocal, toric, and colored lenses. Whether you wear daily, weekly or monthly disposables, or conventional (vial) lenses, check out our selection of lenses that fit your needs. Before being fit with contact lenses, a comprehensive eye exam is performed. In this exam, your eye doctor in Kissimmee determines your prescription for corrective lenses (just a glasses prescription at this point) and checks for any eye health problems or other issues that may interfere with successful contact lens wear. Tear film evaluation: To be successful wearing contact lenses, you must have an adequate tear film to keep the lenses and your cornea sufficiently moist and hydrated. This test may be performed with a liquid dye placed on your eye so your tears can be seen with a slit lamp, or with a small paper strip placed under your lower lid to see how well your tears moisten the paper. If you have dry eyes, contact lenses may not be right for you. Also, the number of tears you produce may determine which contact lens material will work best for you. In many cases, trial lenses will be used to verify the contact lens selection. 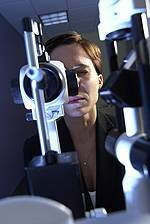 Lenses will be placed on your eye and your eye doctor will use the slit lamp to evaluate the position and movement of the lenses as you blink and look in different directions. You will also be asked how the lenses feel. Often, your doctor will be able to see warning signs before you are aware of a problem with your contact lens wear is developing. If such warning signs are evident in your follow-up visits, a number of things may be recommended, including trying a different lens or lens material, using a different lens care method, or adjusting your contact lens wearing time. In occasional cases, it may be necessary to discontinue contact lens wear altogether. After finding a contact lens that fits properly, is comfortable for you and provides good vision, your doctor will then be able to write a contact lens prescription for you. This prescription will designate the contact lens power, the curvature of the lens (called the base curve), the lens diameter, and the lens name and manufacturer. In the case of GP contact lenses, additional specifications may also be included.